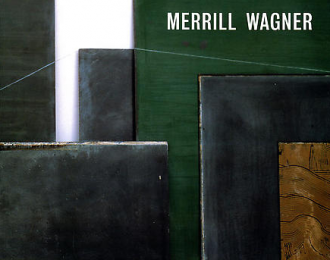 Sundaram Tagore Gallery is pleased to present an exhibition of new paintings by Merrill Wagner. A painter with a long-standing commitment to exploring the relationships and tensions between textures, patterns and mixed media, Wagner is noted for works of geometric abstractions using large canvases of steel, hard edges and bright contrasting colors. The exhibition opens May 25 and closes June 19. Inspired by the minimalist Eva Hesse in the late 1960s, Wagner started to experiment with diverse materials and media. By the 1980s, she was painting on stone, steel and slate, focusing on the surface of the material, the geometric patterns inherent within it, and ordering the painting around its individual marks, blemishes and colors. For the artist, these enormous paintings represented those things within the landscape that cannot be changed – the ocean, the desert, or the night sky. As Roger Boyce noted in a 2002 Art in America review, "The material gravity and anonymous aesthetic of the industrially manufactured [materials] stand in for the assertive indifference and receptive sublimity of nature." Wagner was raised in the Pacific Northwest and moved to New York City in the late 1950s, after graduating from Sarah Lawrence College. She has held teaching positions at Princeton University and Parsons School of Design. In 1989, Wagner received a National Endowment for the Arts Visual Artists Fellowship Grant. Her work has been included in over forty individual and group exhibitions in the United States and abroad. She has been a member of the American Abstract Artist since 1976 and served as its president from 1982 to 1985. Sundaram Tagore Gallery is located at 137 Greene Street (between Prince and Houston) in SoHo, New York City. It is open daily from 11 am to 7 pm. For additional press information, or to request images, contact Yng-Ru Chen, Publicity Manager at 917.697.5107 or yng@sundaramtagore.com.